Sometimes it’s hard to come up with new ideas when it comes to decorating your home right? You look at magazines for inspiration- but how do real people decorate their homes for summer in a beautiful and practical way? 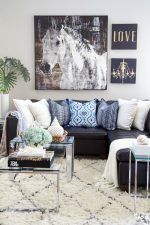 Well I have the answer to that with today’s collection of 14 Takeaway Decor Ideas from the bHome decor and DIY enthusiasts and the bHome Summer Home Tour! 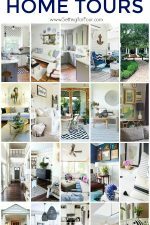 I invite you to tour each of these gorgeous, relaxed homes and see what new ideas you can pick up to add to your spaces! 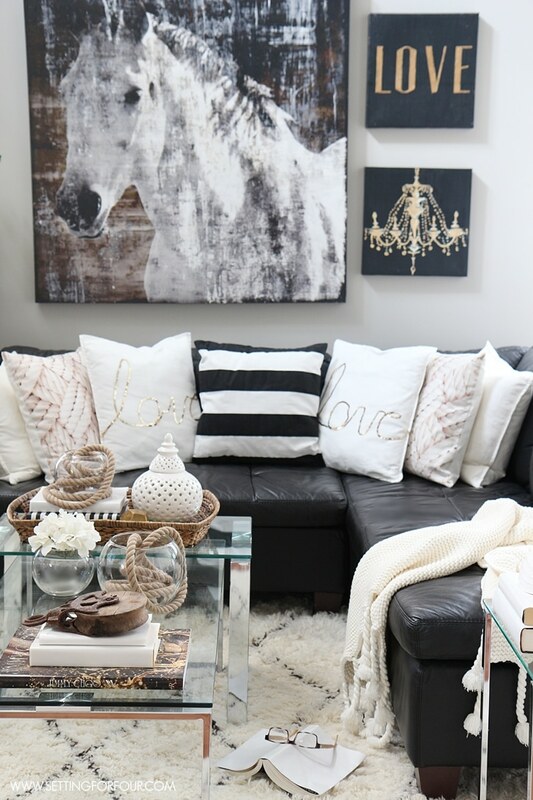 These home tours will definitely inspire you with their easy breezy summer decor, I promise! No stylists or magazine photographers here – just real people with real homes! ….and for each home I’ll also give you my easy takeaway decor idea for summer. Takeaway Decor Idea 1: Adding blue glass bottles (new or vintage) adds instant summer color and style. 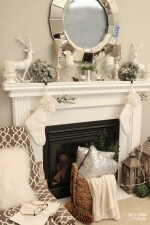 Tuck them into corners of a room, by a fireplace, on a kitchen island or on a dining table! Takeaway Decor Idea 2: Add a few branches of greenery (from trees or shrubs) snipped from your yard for a more relaxed look to your floral arrangements. 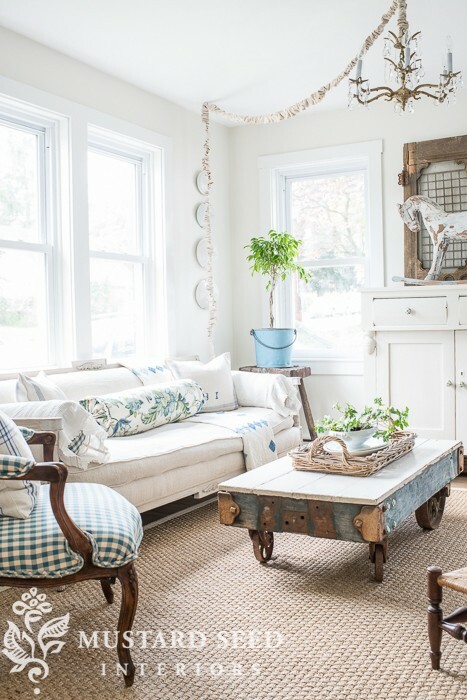 See Cedar Hill Farmhouse’s summer house tour for more relaxed farmhouse summer decorating ideas. 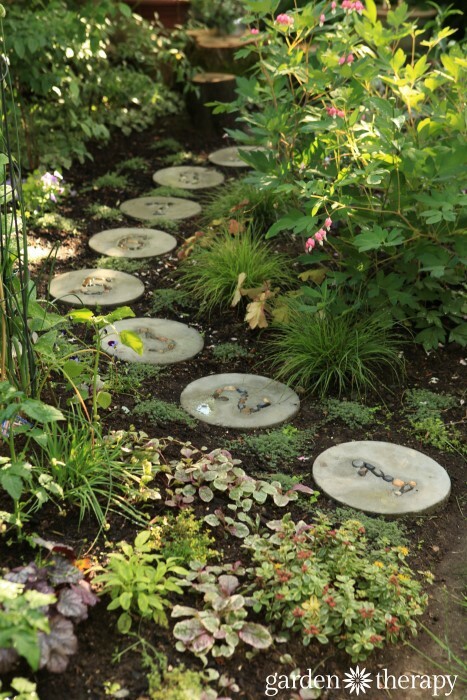 Takeaway Decor Idea 3: A fun numbered stepping stone path is an easy way to keep your feet and shoes clean in the garden and adds style and whimsy! Takeaway Decor Idea 4: Add metal obelisks, like the one pictured in the left of the photo, and other decorative objects to your gardens to add interest. See my Summer Lodge Deck for my relaxed outdoor decorating ideas. Takeaway decor idea 5: Give your home an instant beachy look with bowls of found or purchased shells added to coffee tables, end tables and your mantel! Takeaway Decor Idea 6: Decorate your coffee table for summer with a whitewashed tray filled with a couple of coffee table books, a small round vase of garden flowers and some coasters. Check out my DIY blue scrapbook paper and Mod Podge coasters to make some yourself! See my DIY Paint a Tray with Grey Finish idea to revamp a tired dated tray. 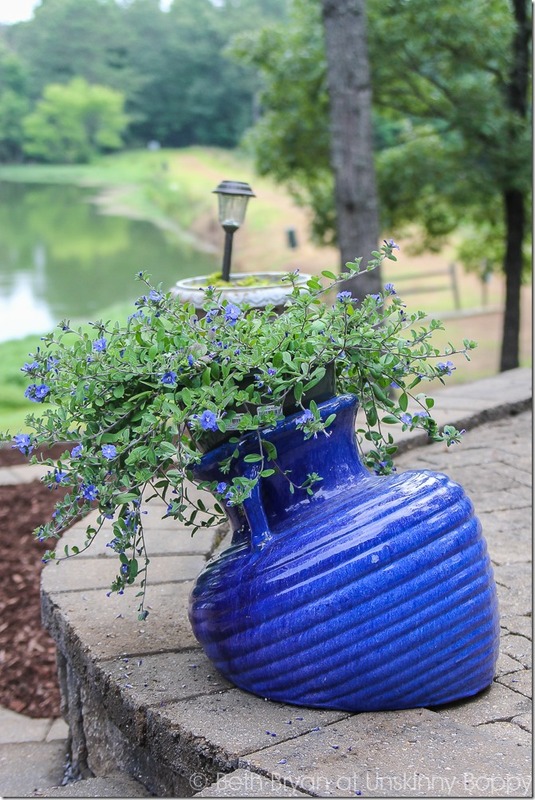 Takeaway Decor Idea 7: Here’s a quick and easy container gardening idea: Add a trailing hanging plant to a colorful container, like this slumping cobalt blue pot, for a big pop of gorgeous summer color. Leave the hanging plant inside the pot that it comes in for instant results! 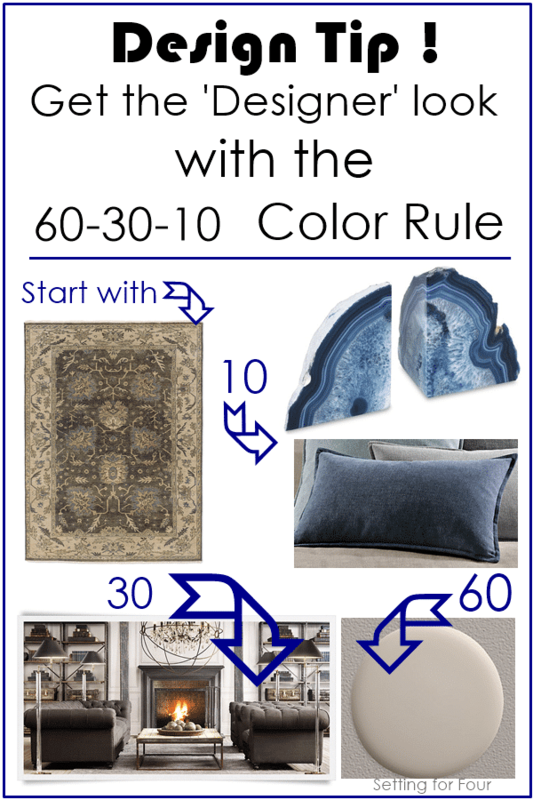 Takeaway Decor Idea 8: Repeating the same color (blue flowering plant with blue pot) will give your decor a stronger look that gives your space flow. 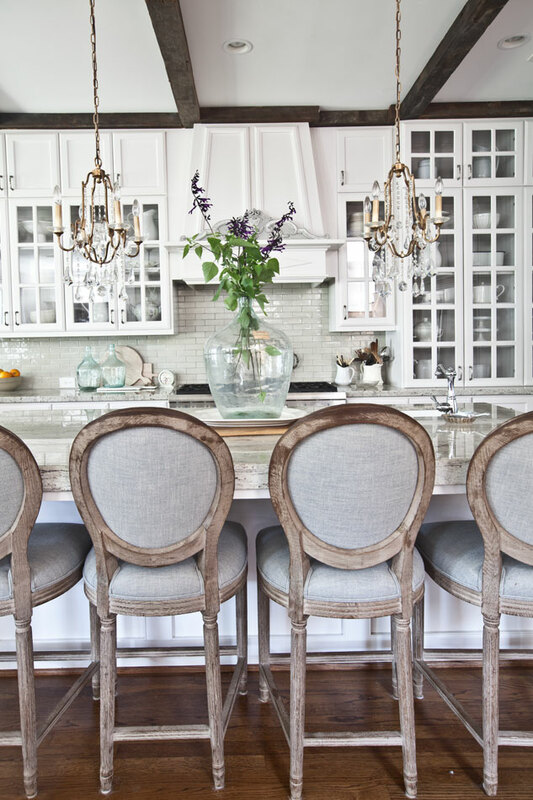 Takeaway Decor Idea 9: Cover an ugly chandelier chain with a ruched fabric cover – so pretty! Takeaway Decor Idea 10: Switch out a plant pot for one in a summery blue to lighten and brighten your rooms for the warmer weather. 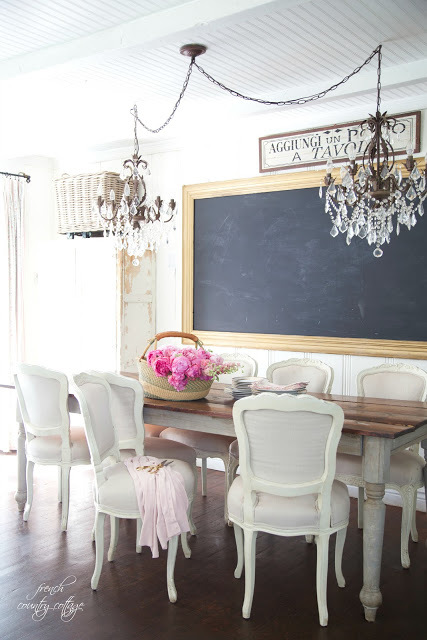 Takeaway Decor Idea 11: Add an over sized chalkboard to your dining room! Paint a rectangle of chalkboard paint on your wall, add a DIY frame made from stock molding found at the lumber store and add your dinner menu or a list of your favorite wines! takeaway Decor Idea 12: Add a handled basket of summer flowers to your table for a gorgeous relaxed summer centerpiece idea. Add a shallow bowl of water to the basket and make sure the stem ends are immersed. Fill with roses, snapdragons…any summer flower you may have from your garden! Takeaway Decor Idea 13: Keep your eye out for enamel, glass or pottery pitchers at yard sales and thrift stores. Add a bunch of peonies or roses to one for quick and easy, instant summer decorating! 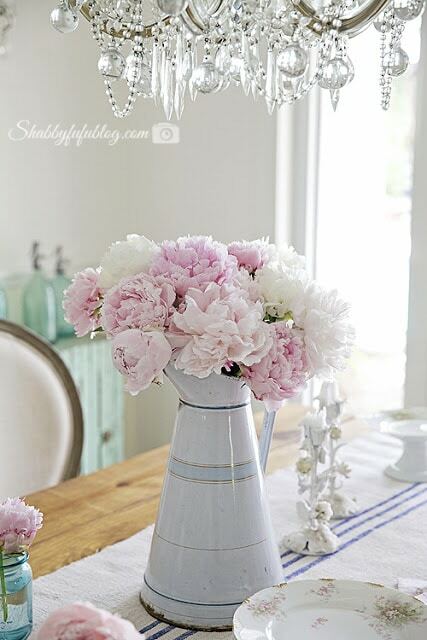 Aren’t these pink peonies stunning?! Takeaway Decor Idea 14: Make your own budget frindly DIY vintage-look grain sack runner by panting stripes onto a drop cloth. 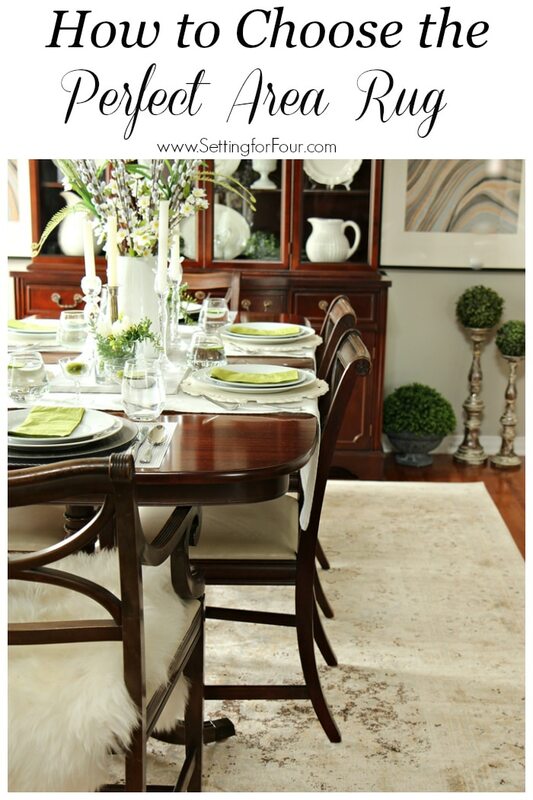 You may also like these design and decor tips! 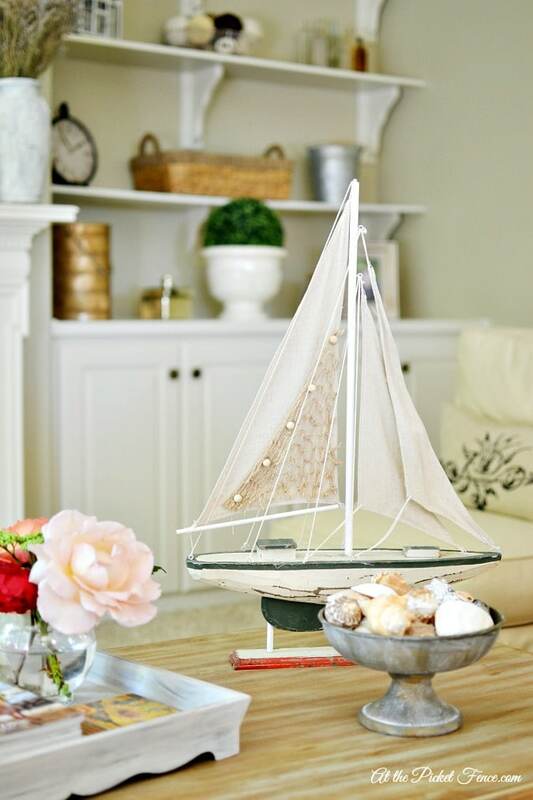 Great round up of summer decor! Love each and everyone one of these ladies homes…such a great inspiration! Thanks so much Emily for visiting!! 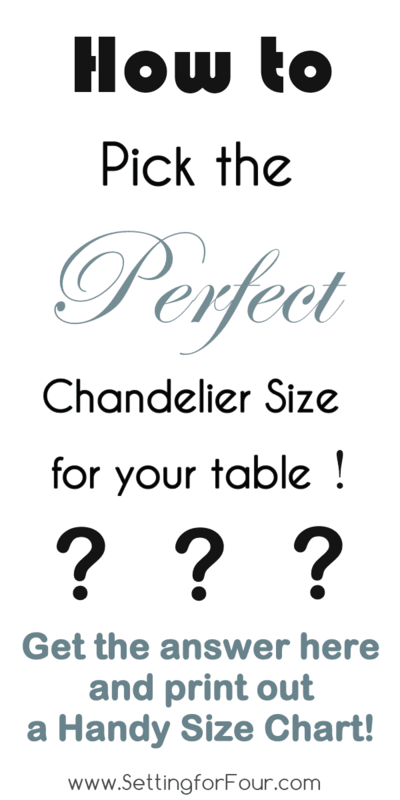 Your chalkboard sounds beautiful – I’m sure you are really enjoying it in your dining room! Happy Summer! Thanks Cathy!! I’m so glad you like these summer decorating ideas!